Hypertensives are at a risk for developing cardiovascular diseases, kidney diseases and various other health issues as their heart is under stress because it has to exert more force to pump the same quantity of blood. You need to cut down on your sodium intake, lose weight and increase your potassium and fiber intake to lower your blood pressure. And what better than a salad can provide you with a low calorie alternative to lower your blood pressure! The choice of your salad depends on your taste preferences, but make sure you choose high potassium and low sodium fruits and veggies like Apple, Berries, Banana, Capsicum, Tomatoes, Orange and other citrus fruits. You can also add some sprouts to your salad which will also give it a protein punch. Instead of using salt for taste, use Adjuncts like lemon, tamarind, amchur powder, pepper, cinnamon and mustard powder for taste. This will reduce your sodium intake without compromising on taste. Avoid using salad dressings which may have a lot of unhealthy fat. Make sure you have atleast 25 – 30 grams of fiber daily through dietary sources which will keep you satiated for a longer time, and a wholesome salad can help you do that. Apart from providing fiber, salad will also provide you with a lot of nutrients like B-vitamins and iron. It will also help you lose weight which is a pre requisite for a normal blood pressure. Make sure you also a have a bout of regular physical activity which will also help you to regulate your blood pressure levels. Have a Healthy and tasty Salad treat! 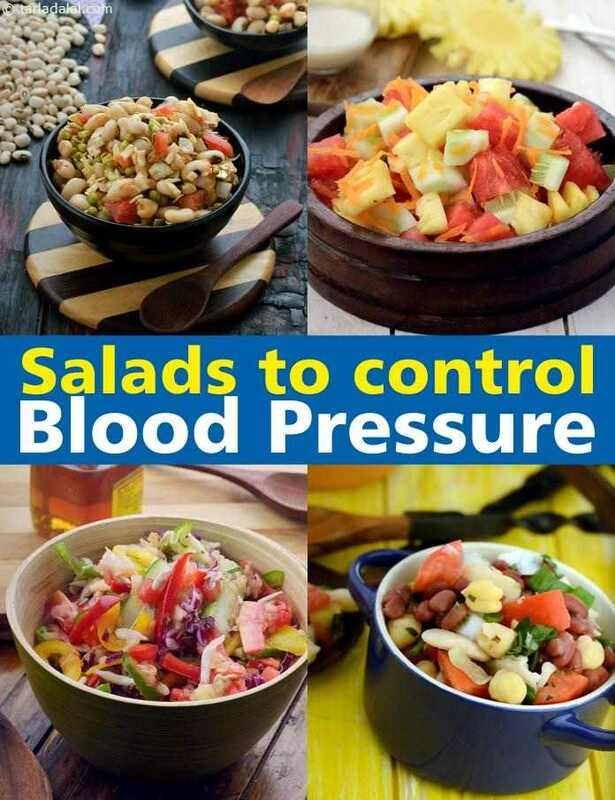 4 ways to reduce blood pressure while making salads. 1. Avoid too much fat. 4. Measure your salt used in the salad.